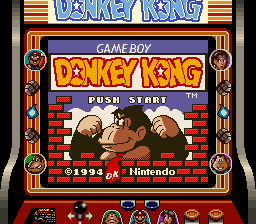 The Game Boy Donkey Kong is the precursor to the Mario vs. Donkey Kong series. Grab keys, open doors, throw barrels at monkeys. There are several surprises to be found when playing the game using a Super Game Boy adapter. This stage option appears directly after the 9-5 option. Selecting it effectively freezes the game. To access these stages, use Game Genie codes 3E4-F3D-081 ? ?4-F4D-4CE 004-F5D-C49 where "??" is the stage ID. This will send you to the appropriate stage when you try to enter stage 1-1. To actually play the stage, be sure to die on stage 1-1 once before turning on the codes. Identical to stage 9-9, with two exceptions. The first is the Rappy enemy circling the middle platform. The second is this odd counter. It displays how many times in the game you've hit an object while doing a handstand. Like stage 65, but with two Rappies. In stage 67 the two Rappies move faster. An odd hybrid of stages. The layout is from stage 0-1 (25m), but the level graphics are from stage 9-5. Interestingly, if the same stage is accessed from World 9 (by using the same Game Genie codes as above, but using a saved game that has already reached World 9 and entering a World 9 stage with these codes enabled), certain behaviour differs. The stage starts immediately, without Pauline's (misplaced) cry for help; and, if the stage is completed, Donkey Kong actually reacts to Mario reaching him... in the same way as stage 0-1! This does not occur when the stage is accessed from any other World. This may suggest this stage was originally intended to be played from World 9 - perhaps Stage 9-5 wasn't always the full-scale version we ended up with in the retail release? An almost barren stage, this takes up the remaining stage ID slots (69-FF). There is an unused medium explosion SOUND 410C0088 command in all versions, located at 0x078100. This could have been used anywhere, although it would have likely been during the boss battles when Donkey Kong stomps the ground making objects fall, or when Giant Donkey Kong slams his fists in the final battle. Game Genie code 027-71C-916 will replace the SOUND 4180808C loaded shortly after booting up. Since the game is locked in Game Boy mode, none of the Super Game Boy features are accessible, which is rather unfortunate because it is one of the most greatly enhanced games when played on one. This page was last modified on 25 June 2018, at 22:37.